Aunt Sally in Oxford, Toad in the Hole in Lewes, bagatelle in Chester, quoits in Darlington and bat and trap in Kent - they sound like relics of a bygone age, and yet contrary to popular belief the pub games of Britain live on. Traditional games such as nipsy (the poor man's golf), played by Barnsley miners, may have died out in the 1990s, joining in the history books such former favourites as guile bones, noddy board, slide thrust, fox-mine-host, tick-tack, and the mysterious milking cromock. But new games emerge all the time so that nowadays regulars are just as likely to be entering pub quizzes - the first quiz league was recorded in Bootle in 1959 - or playing pool (which arrived via Australia during the 1960s) or petanque (brought over from France). Fashions may move on but find any decent pub and the chances are that there are games to be played. 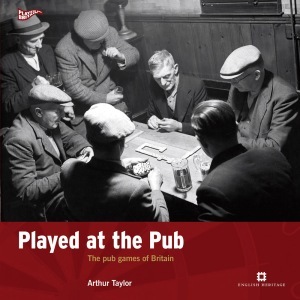 Arthur Taylor published his first study of British pub games in 1976, updated it in 1992, and now, with Played at the Pub brings us his third and most extensive study so far. This time, to add to his encyclopaedic knowledge and infectious enthusiasm there are copious illustrations, many of them contemporary images taken by English Heritage's own specialist photographers. Played at the Pub is not only beautiful to look at and overflowing with great stories it is also an informative guide. Where can you watch or play skittles? Where are the best pubs to play table football? Why are some of the dartbords in Manchester pubs so different to the ones you see on TV? Where can you legitimately fire a rifle in the snug? And what exactly is dwile flonking? Dipping into Played a the Pub one can almost smell the polished wood, hear the tinkle of glasses and the sound of laughter. Never has cribbage or dominoes appeared so alluring.